It is still very necessary to speak truth to move society toward greater justice. We haven’t reached MLK’s mountain top. But we’re getting there. The January 15 New Yorker magazine cover shows the Rev. 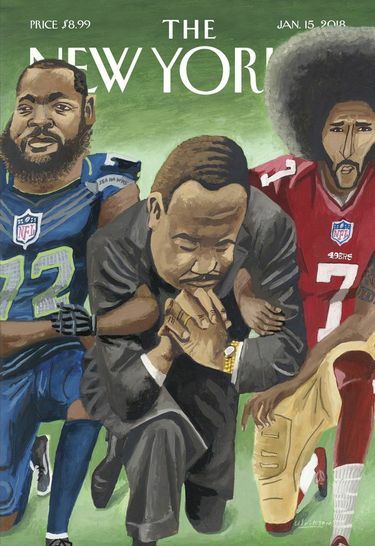 Dr. Martin Luther King Jr. kneeling between Seahawks defensive end Michael Bennett and former San Francisco quarterback Colin Kaepernick. The artist Mark Ulriksen created the image after wondering what King would be doing if he were alive today. The question is really, what should we be doing? Over the next few days, that question will be asked at numerous ceremonies celebrating the gains of the civil-rights movement and trying to measuring where we are now and what’s left to do to get to where the movement pointed us. We’ve had a mixed-race president, and social media was all about Oprah for president for a while this week. We also have segregated neighborhoods and schools and great economic disparities. The civil-rights legislation of the 1960s also made changes for women and other groups that face discrimination and opened the country’s doors to immigration from parts of the world that had been screened off. We are a far different country today because of all of that, and yet the changes that brought progress also fed movements to take America back to where it had been before, though many things never fundamentally changed to begin with. Barack Obama, theoretically the most powerful person on the planet as president, had to carefully weigh his words and actions so as not to appear too black. But the country elected as his successor a white man who is gleefully unfettered in his pronouncements regarding race, gender and anything else he cares to comment on. We have not yet reached the mountain top. In Seattle, we have a woman as mayor, and both of our state’s senators are women, but the tech companies that make Seattle home are still trying to figure out how to make equality a reality for women. Women in the workplace are still subject to abuse and harassment. That, too, is about who still wields real power. Striving for greater civil and human rights is always about fighting against entrenched power. And that fight is a battle of ideas. People who hold power know how to distort the truth in support of their position. Why did white evangelical Christians vote for a man who seems to go against many of the values they proclaim? Why did a majority of white women vote for a man who in word and deed has shown disdain for women? They voted for him because they accepted his enemies as their enemies and embraced his promise to protect them from the bad people. Mexicans supposedly committing crimes and taking away jobs. Muslims coming here to terrorize Americans. Trump voters saw in him a champion against so-called political correctness and the concessions to various minorities that it implied. The truth is that qualified people should get a fair shot at a job and equal pay if they’re hired. But if you believe that some people are naturally smarter, harder working, just plain better because of gender, race, religion or some other single characteristic, your idea of what’s fair would reflect that bias. That kind of belief helps explain a lawsuit filed this week by an engineer who was fired from Google after he criticized its diversity policies. He accused Google of discrimination against people who are male, white or conservative. So what do the facts at Google suggest? Women are 20 percent of Google’s tech workforce. Black employees are 1 percent of its workforce, while Latinos are 4 percent. I don’t think white guys are getting a bum deal at Google or at other tech companies with similar numbers. Google has been trying to add diversity for the past few years. That’s a problem only if you believe the tech workforce looks the way it does now because white men are just better. The truth is that other people can do the work if they’re given a fair chance. The football players who knelt this year and last wanted to call attention to the shooting deaths of people by police when force is excessive, but officers are not held accountable. The president weighed in against black athletes taking a stand, and many people who joined him argued that the players were disrespecting the military. The protests weren’t in any way about the military. Today, as in King’s time, marching toward greater human rights still requires fighting lies and promoting truth.